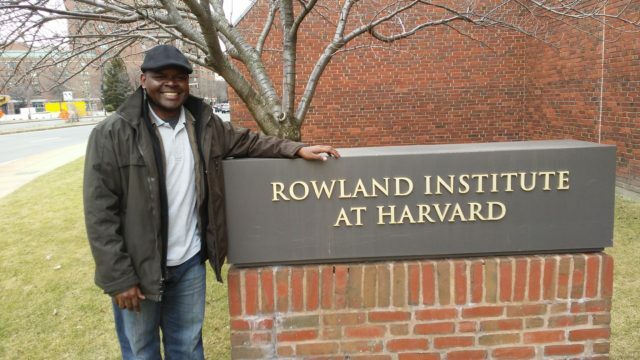 The extraordinary life journey of Desmond Yengi, Class of 2009, has taken him from fleeing for his life at the age of four in war torn Sudan to post-doctoral work at Harvard University. The gunshots of government soldiers brought an end to life as Desmond knew it as he and his aunt were forced to flee the family home to hide in bushes, were reunited with his mother in the night, and spent the next two weeks living in the forest until they could escape across the border into Uganda. Desmond’s family tried to survive in a shelter they built for themselves across the border, but the proximity to the war meant bombs from the Sudanese planes often had no respect for boundaries, and there were no opportunities for Desmond’s education. So his family allowed themselves to be taken to a transit camp meant for a short time and then transferred to a settlement camp where harsh conditions dictated that only the strong survive. In 1997, after seven years in the transit refugee camp, Desmond and his family were moved to a settlement camp after the transit camp closed. Here every family received a piece of land where they could grow crops. However, many of the children were at a risk of being taken by the Lord’s Resistance Army and forced to fight, so Desmond’s mother moved the family to another camp, the Keyo refugee camp. In 2003, after finishing middle school, Desmond received a scholarship to attend the United World College of Atlantic in Wales. Following his two years there, a Davis Foundation scholarship and the help of recruiter Pat Kirby, who worked through a number of authorities to help him get a visa from the Kampala embassy, brought Desmond to Westminster where he majored in mathematics and chemistry. 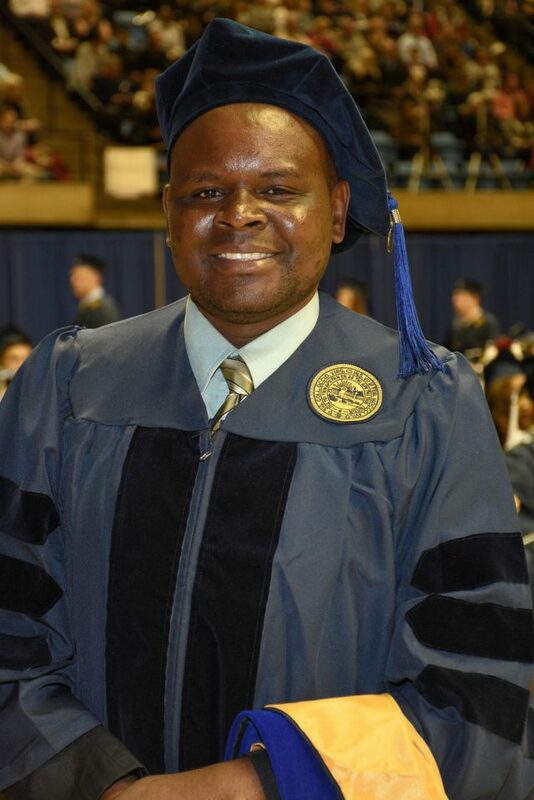 Desmond had worked in Prof. Frerichs’ research lab for a couple of years, and when the professor was attending a research conference at Arkansas, he found out a colleague at West Virginia University still had an opening for a research graduate assistant in chemistry. Desmond applied and was accepted. Desmond’s graduate work investigated synchronization patterns in a population of coupled chemical oscillators. The patterns formed by these coupled oscillators might be responsible for functional behavior in many systems. 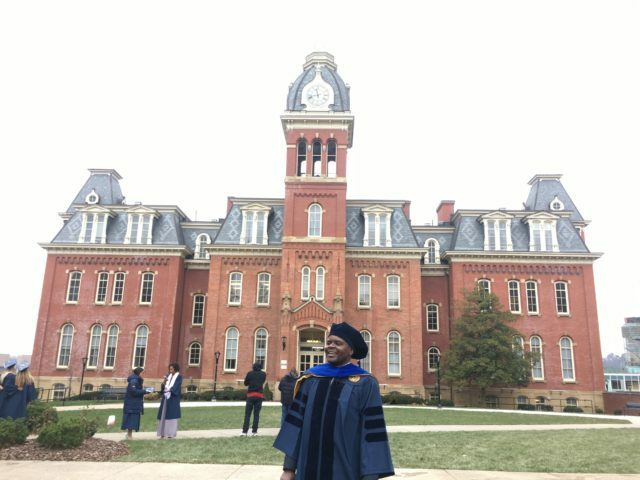 In December 2017, Desmond completed his Ph.D. in physical chemistry with a research focus on nonlinear chemical dynamics. The following month he assumed a position as a post-doctoral research fellow in the Department of Earth and Planetary Sciences and the University’s Origins of Life initiative at Harvard University. In his research, he is involved in a project that investigates the origin of early life using oscillatory chemistry. The sophisticated laboratory facilities at Harvard are a far cry from the stick in the dirt that began Desmond Yengi’s educational journey. Westminster College, and particularly the encouragement and support of Pat Kirby and Professor Frerichs, played a critical role in helping him reach this level of success. He is just one of the many young Westminster alumni to keep watching.